Another glimpse of my purchases from Singpost last week. 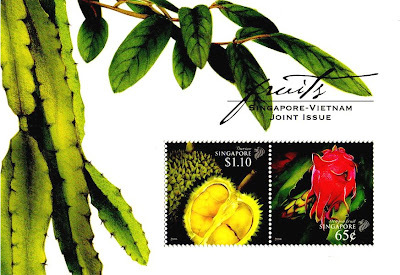 This is a Singapore-Vietnam Joint Issue miniature sheet featuring the "King of fruits", Durian and the ever-popular, Dragon fruit. It was issued on 18th Nov 2008. 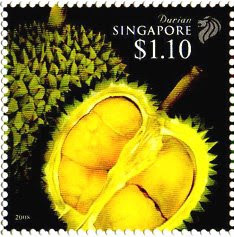 The first stamp depicts durian (my favourite fruit). Widely known and revered in Southeast Asia as the "King of Fruits", the fruit is distinctive for its large size, unique odour, and formidable thorn-covered husk. The fruit can grow up to 30 centimetres (12 in) long and 15 centimetres (6 in) in diameter, and typically weighs one to three kilograms (2 to 7 lb). Its shape ranges from oblong to round, the colour of its husk green to brown, and its flesh pale-yellow to red, depending on the species. The edible flesh emits a distinctive odour, strong and penetrating even when the husk is intact. Regarded by some as fragrant, others as overpowering and offensive, the smell evokes reactions from deep appreciation to intense disgust. While Wallace cautions that "the smell of the ripe fruit is certainly at first disagreeable", later descriptions by westerners are more graphic. 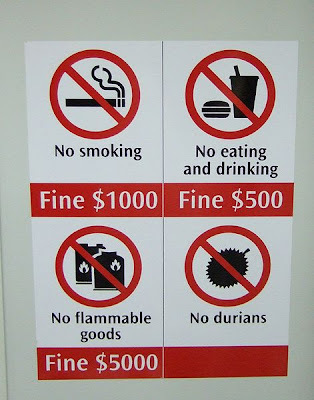 British novelist Anthony Burgess writes that eating durian is "like eating sweet raspberry blancmange in the lavatory." Chef Andrew Zimmern compares the taste to "completely rotten, mushy onions." Anthony Bourdain, while a lover of durian, relates his encounter with the fruit as thus: "Its taste can only be described as...indescribable, something you will either love or despise. ...Your breath will smell as if you'd been French-kissing your dead grandmother." 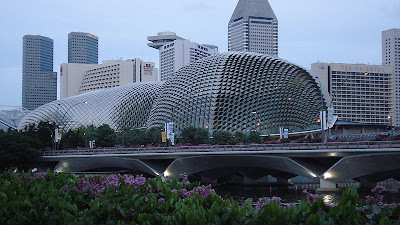 The odour has led to the fruit's banishment from certain hotels and public transportation in Southeast Asia. 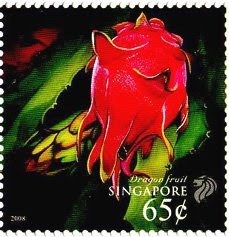 The second stamp shows the Dragon fruit; a tropical fruit which is very popular in Southeast Asia. Vietnam is the main commercial producer of dragon fruits in this region. The fruit, apart from being refreshing and tasty, has loads of vitamin C and is said to aid digestion.The plant is a climbing cactus vine that grows well in dry areas. Because of its epiphytic nature, it grows best in soil with a high level of organic materials. The flowers are white and large, measuring 30 cm long or more. They are ornate and produce a sweet fragrance when in bloom. The flowers bloom for one night only. Pitahaya plants can have between four to six fruiting cycles in one year. It can be propagated by seed or by stem cuttings.